Over the past few years I’ve built a wide variety of instruments. Some are toys/keyboards/whatever that I re-purposed through circuit bending and modification, some are oscillator based instruments that I built from scratch, and more and more I’ve been dabbling in make effects pedals. I’ve built more things then I could ever possibly list here, but I will try and cover some of the more interesting things. If you want a better idea of what all I’ve done you can got to my Soundclick page. I also have a Youtube Page where you can “see” my instruments in action. I have two effects pedals that I regularly build. One is the “Mutator” which is a heavily modified toy voice changer re-purposed for guitar/whatever. See those here. The other is a modified Fab Echo. 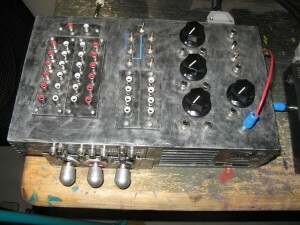 I take this rather tame Echo pedal, and modify it into a fully function delay with lots of features. See those here. I’ve also tried my hand at making more traditional pedals, which you can see here. I’ve modified lots of keyboards, mostly lower end Casios and Yamahas, but also some toy keyboards as well. The mods have been anywhere from a simple pitch control or glitch push button, all the way to an out board RCA patch (Modular Synth Style) with hundreds of possibilites. One of the holy grails of bending. Most benders want one, have done one, or have done many. 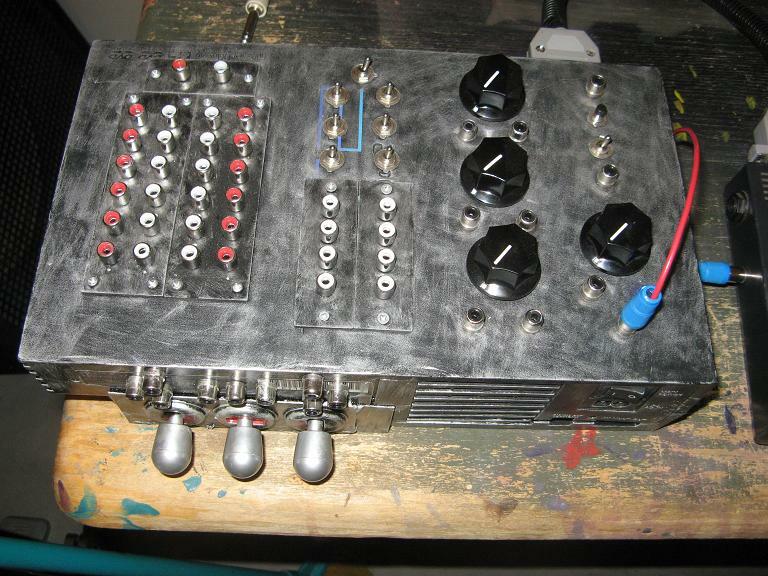 The first few a did were based on the “Tablebeast” mods (16 point patch bay with on/off switches). Now that I have some experience with them I’ve undertaken some more complex mods. 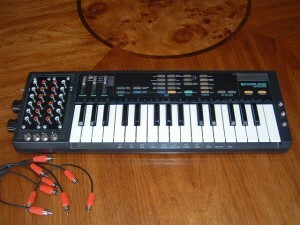 This SK-1 has pretty much the same mods as the above one, but with the addition of body contacts. 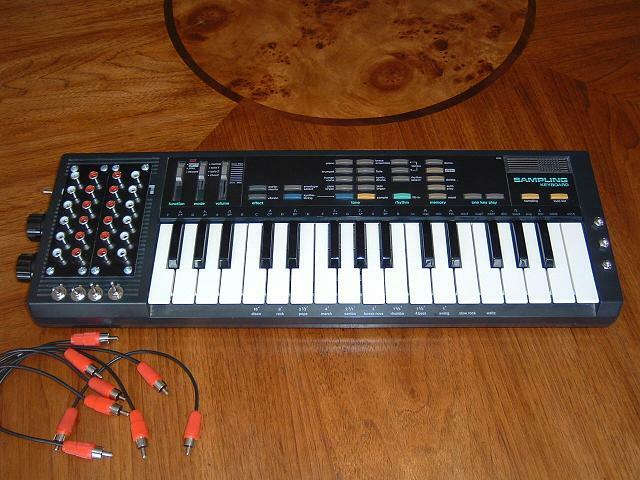 This SK-1 is sold. 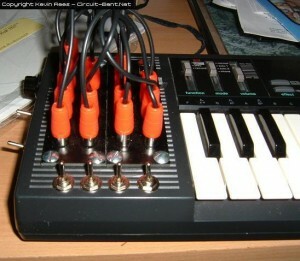 This just the patchbay for my “Glitchstation” SK-1. 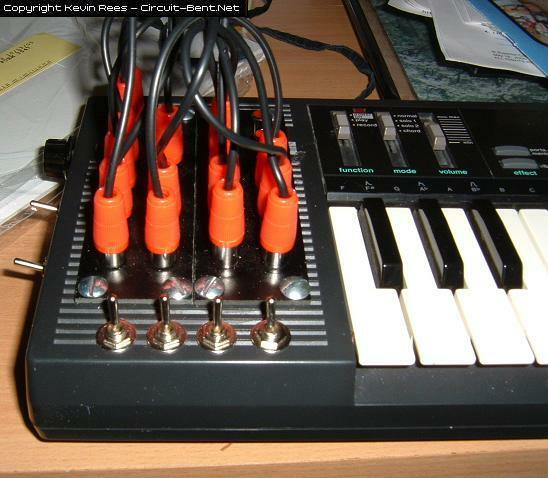 The keyboard itself only had a 25 pin connector, pitch knob+body contact, drum kill switch, and 1/4 inch output. The patchbay itself contained all the controls. Housed in an old PS2 case (hence the name) it contained a 26 point patchbay (2 points to ground), 8 point switching patchbay, 3 knobs of different values, and sample and hold section, 3 momentary joystics, and an LFO that can be patched with everything else. This project was complicated and difficult, I don’t know if I would ever take it on again. This keyboard/monster has been sold.